Baseball player; born in Troy, N.Y. One of baseball's first superstars, he combined power and speed during his 16-year career as an outfielder/catcher (1878--93), mostly with the Chicago White Stockings and Boston Red Stockings. The once-popular song, "Slide, Kelly, Slide!" 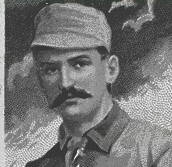 (1889) was inspired by the fans' chanting that accompanied his frequent stolen bases. Handsome and flamboyant, he was known as baseball's "king of the diamond." In 1945 he was elected to baseball's Hall of Fame.